University records in digital formats are subject to the same retention and disposition instructions as records in other formats. The important factor in records management is information not format. Digital records should be evaluated using the General Records Retention Schedule. The following information is general guidance to help you understand more about digital records management. Please contact us to discuss your specific situation in more detail. "Born-digital" is a term archivists use to distinguish records that were always digital from paper records that we make digital through scanning (also called digitization). When we discuss digital records, we often mean born-digital records. Examples of born digital records are things like email, websites, PowerPoint files, Excel files, or even older formats like WordPerfect files. Unfortunately there is no silver bullet for keeping digital records well organized. The simplest advice is to be proactive in creating and consistently using digital folders that are named descriptively and are understandable to people beyond yourself. Often with digital records we collaborate more and many people are involved in editing and storing digital files. If this is true of your team, try creating a folder and file naming convention that the entire team agrees to use. This will help with consistency down the road. Try to incorporate the Retention Schedule series information into your file organization plan. If you organize things based on record type and disposition timeline, you may save yourself time later. The key to digital records storage is making sure the files are backed-up consistently and any sensitive data is appropriately protected. 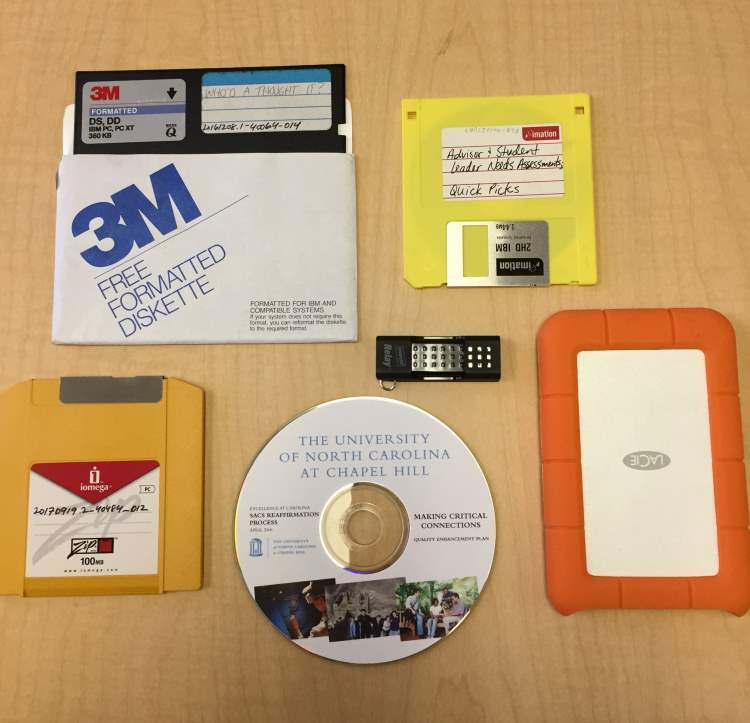 Many digital storage options are available to UNC employees. The University Archives doesn't have a definitive guide on what to use. You should work with ITS to address storage and back-up needs. We do, however, encourage offices to use modern storage options and address obsolete storage devices. If there are important records currently stored on things like floppy disks or CDs, you should contact us to talk about how to deal with these records. We don't require specific file formats for records that will be transferred to the University Archives for permanent retention. You should use file formats that best suit the work your office does. If you'd like to know more about file formats that are better for long-term digital preservation, please contact us. If you are interested in phasing out paper files and keeping only digital records, you can do so. Pick a date a couple months out as the start of digital record keeping practices for your unit. For example you may decide to start keeping records digitally at the start of the next semester. determining the storage location and folder structure that you will use to organize records. creating file naming convention guidelines for your team. ensuring digital storage is backed-up. ensuring digital storage is secure - especially if your office creates and stores sensitive records. Communicate with you team about the changes and the storage plan, so they are prepared for the change in advance and know where digital files should be stored. Don't worry about scanning existing paper files. Simply start digital recordkeeping with files that are already in digital formats. Review digital files for records management requirements yearly. Refresh staff on use of digital storage, file naming conventions, and folder structure periodically. Make records management training and file organization part of onboarding for new staff. Scanning paper files for digital use and storage does not change your records management responsibilities for those materials. You will still be responsible for securely storing and disposing of the records based on the Retention Schedule. If you are running out of space for paper files, it might be a good time for a consultation. There may be paper files that are ready to be destroyed or transferred to the Archives. Please contact us to set up a consultation. If you feel that scanning the paper files is the best option, you'll need to consider file formats, storage needs, and organization of the resulting digital copies before beginning the scanning project. We are happy to advise on this process. Please contact us for more information. As of April 8, 2019, there is a new policy for email retention. See the Records Retention Schedule Appendix A for complete details. This approach is based on the Capstone Approach developed by the National Archives and Records Administration. Under this approach, email records created and received by employees in selected administrative positions will automatically be retained as permanent records in the University Archives. All other email accounts will be retained for a period of five years after the employee leaves the University and then discarded. All employees still have a responsibility to evaluate emails, like other record formats, based on the Records Retention Schedule and individuals not in "Capstone positions" can still work with us to transfer permanent records if needed. How do I know if an email is a record? It's all about the information contained in the email. Emails that contain unique and significant information or conversations about the functions and activities of your department should be retained based on the General Records Schedule. If an email message is determined to be a record, then it must be maintained retained or deleted according to the Retention Schedule. It is the responsibility of each employee to manage their email records. Delete transitory emails right away, so they don't crowd your inbox. Examples of transitory emails would be messages about changes to meeting locations, donuts in the break room, or University announcements. Use folders to organize mail that would be considered a record. Sort the mail into folders actively at regular intervals. If your email is scheduled to be sent to the University Archives, we'll work with you on the transfer process. In general, you'll export the selected folders and/or emails from Outlook for transfer. What digital records should we send to the archives? If there is extensive duplication between digital originals and printed copies -- only send us what you consider to be the record copy. In general this means you should send either the paper or digital, but not both. If you've scanned paper files, we generally prefer to receive the original paper copies rather than the digital images of the paper copies. I found floppy disks in my office, but don't have the hardware to access the disks to review the files. Can UARMS help? We keep a range of disk drives for our day to day work with obsolete storage devices. Depending on the number of disks and staff availability, we may be able to help you review some of the disks. Please contact us! My unit is getting a new content management system or document management software. Do we need to manage those records? Do you have advice for selecting a system? If you store records in an information system or content management system, you still have records management responsibilities for that information. We can work with you and ITS to figure out how to manage records currently in systems you use. How will the data in the system be stored? Locally at UNC? In a cloud service? How secure does this data need to be? How does the system handle data security? Can we export the data whenever we want? What is the export process like? What are the resulting file types? How can we delete nonpermanent records from this system? To schedule a consultation, please email us at archives@unc.edu. During the consultation, we will review the digital records form, learn more about your technology environment, and discuss strategies for managing records across your team and/or transferring records to the archives. UNC websites and UNC social media accounts are considered university records and many will be preserved for historical purposes. The University Archives uses a service called Archive-It to archive UNC websites and some social media content. If your department is creating or significantly changing a website or social media account, please contact us by email. If we haven't archived your unit's website, please email us to nominate a website for archiving.